Nadine (Hailee Steinfeld) and Krista (Hayley Lu Richardson) are inseparable best friends attempting to navigate high school together... until Nadine discovers her older brother and Krista have been secretly dating behind her back. They soon realize that there is a fine line between best friends and worst enemies. 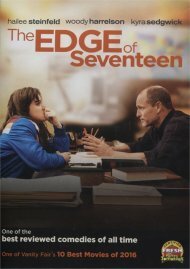 Review "Edge of Seventeen, The (Blu-ra"
Reviews for "Edge of Seventeen, The (Blu-ra"